It’s that time of the year again when Americans gather around big screens at sports bars, laptops in offices (shhh! ), and their phones on the train to see whether their alma mater can shock the nation and just how quickly their entire bracket will go bust this year. 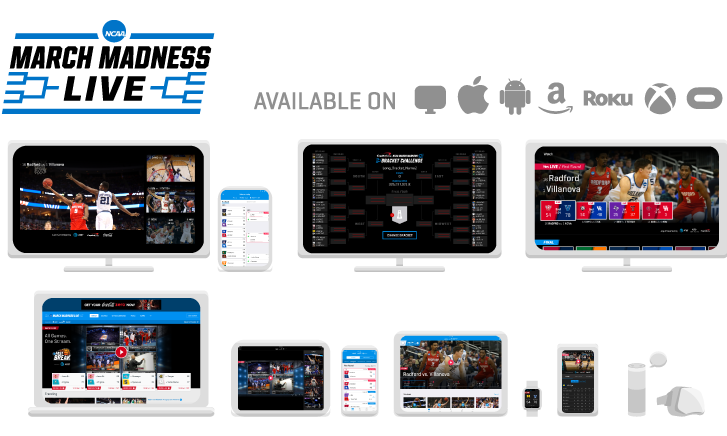 March Madness is a special page on the sports calendar and also brings us one of the pioneers (and reigning champion) of live sports-streaming experiences: NCAA March Madness Live. With the live stream of all 67 games available within the platform — in addition to its own native bracket challenge — the app is the ultimate destination for the most multi-tasked event in all of U.S. sports. This year, Turner Sports, CBS Sports, and the NCAA will team up to deliver NCAA March Madness Live to a record 17 platforms this year. The product, which is in its ninth year, will provide a streaming quality as high as 1080p at 60 fps (frames per second) and will also feature an interactive bracket where users can make their picks, track their progress, and dive right into live video (and highlights) within the bracket. It’s many of these customization features surrounding the live video that helped the product take home a Sports Emmy (Outstanding Trans-Media Sports Coverage) for its 2017 iteration at last spring’s ceremony. This year, the NCAA Digital team is looking to ramp up that aspect of the product by introducing “BracketIQ” tools developed in partnership with Google Cloud. They include a Matchup Analysis system that allows users to add extra statistical analysis into their individual picks or their picks bracket-wide. For example, players can choose statistics or rankings — for example, highest RPI or best defensive team — that mean the most to them and use sliders to set the level of priority. The bracket then can help users make picks based on the stats and elements of a team’s play that they value. As for the live-video-viewing experience, NCAA March Madness Live, whose streaming infrastructure is supported by iStreamPlanet, will also bring back the streaming-exclusive whip-around show Fast Break for the opening weekend. Users will be able to watch a single show comprising the most exciting moments going on, instead of manually selecting the game they’d like to watch at that time. According to Poole, NCAA Digital will also be granting a longer free-preview period for new users looking to get into the product via mobile web. Although users of the product will ultimately need to authenticate using their TV/cable-provider credentials, there was a desire to give more time to those who typically access via mobile web to embrace the product. NCAA March Madness Live is also remaining committed to distributing live games in virtual reality. During this year’s tournament, 21 games will be produced in virtual reality, including the semifinals on Final Four Saturday and the National Championship Game the following Monday. The VR productions are handled by Intel True VR and will stream live coverage and VOD content to a discrete app (NCAA March Madness Live VR) that is available in the Oculus store. This is the third straight year that live VR has played a role in the NCAA Tournament coverage, and Poole says watching live game content will be akin to purchasing a virtual ticket to the broadcast. Early-round games will feature an embed of the television commentary, and any VR production from the Sweet 16 on to the Final will have a dedicated announce crew onsite. NCAA March Madness Live is available on 17 platforms, including this year’s newcomers, Android TV and Oculus Go. The other platforms are iPhone, iPad, Apple TV, Apple Watch, Android handset, Android tablet, Amazon Echo family of devices, Amazon Fire tablets, Amazon Fire TV, Chromecast, Samsung Gear VR, mobile web, Roku players and TV models, desktop web, and Xbox One. Viewers may register using their TV-provider login credentials.